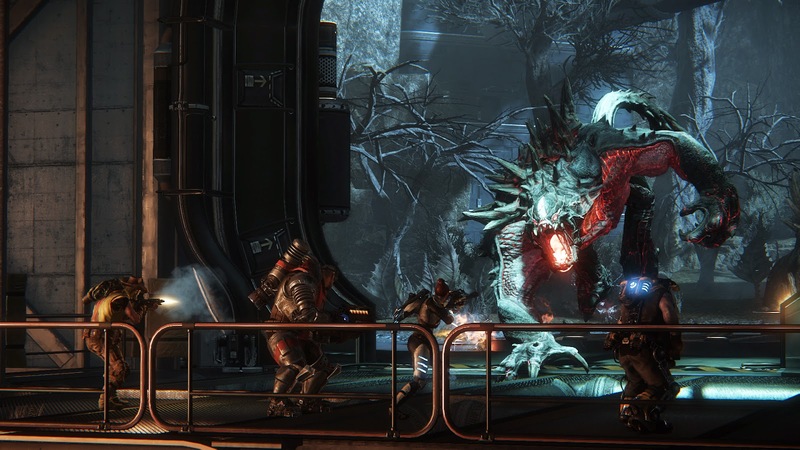 Evolve feels like one of the trickier games I have tried to review to date. The core game is a lot of fun, but more content would have been big. Of course, more content can be had - for a price. The DLC strategy has a lot of gamers upset, which I can relate to as I personally am not a fan of most DLC on the whole. That being said, the content that is provided is well-balanced and a lot of fun, but I cannot help but feel that for a game with so much polish, that it was handled rather clumsily upon release. 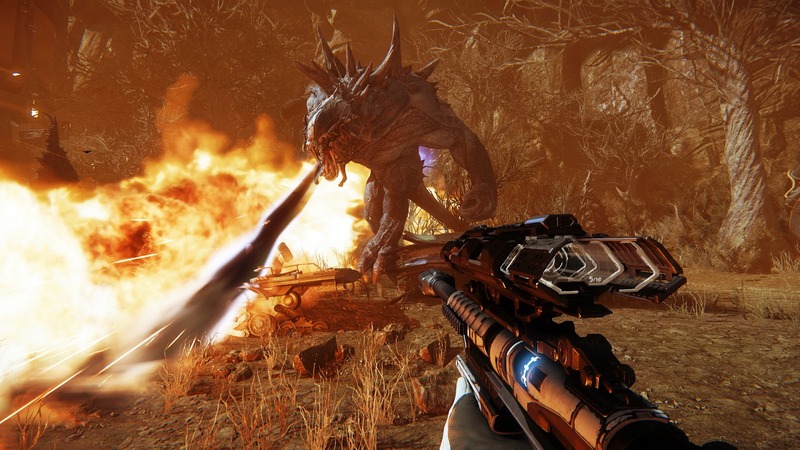 In the end, it leaves Evolve feeling like a fun enough game that missed too many opportunities for its own good. By now almost everyone has heard about Evolve. It has received a great deal of hype over the last couple of years. Thankfully, the end product is as good or better than most of those over hyped releases (I am looking directly at you, Watch Dogs). 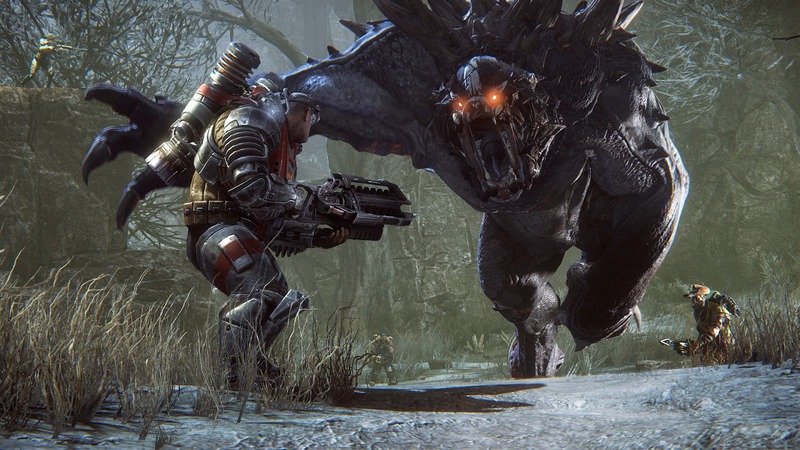 Evolve was built to appeal to different kinds of gamers. Shooting titles are incredibly popular and have been for years, so that was a reasonable place to start. The continued popularity of group shooters like Left 4 Dead also seemed a good foundation, but the idea to make it a versus game of asymmetrical nature was brilliant. That the team has been supporting the game with weekend events has helped Evolve persist past some of the opening day woes that come with so much DLC - though that elephant in the room is right around the corner, for better or for worse. For one, there is the competitive aspect. In games like Left 4 Dead, the teammates are competing to see who does better, but they are held together by the desire to succeed above all else. Enter the ability to play as the monster now, and you have some solid competition in place. The monster is weak to start, but as it hunts and avoids being hunted itself, the monster can evolve into more powerful versions of itself with more powerful special attacks. This sets the stage for an epic game of cat and mouse as the band of four hunters comes after it. Each hunter comes from a type of class: assault (damage dealing), medic (healing), support (shielding/boosting teammates) and trapper (tracking and slowing the beast). For anyone who has played any MMO or RPG ever, these archetypes make sense and provide for a balanced squad. If you are playing with others, you can set up a preference for your class (or to play the monster) and over time you get rotated through the roles while the system attempts to find a fit you will like. It is not a perfect system, but it is generally fair and gets the job done. I did not often find myself sitting around twiddling my thumbs looking for an online match for terribly long. In truth I thought I would enjoy the monster more. I do not tend to team up with others in games if I can help it. I leveled the majority of my World of Warcraft players by going solo. The monster was interesting, but in and of itself clumsy and less fun for me personally than I would have thought. I wound up enjoying the assault class the most, though trapper comes in a close second. The hunt is a great way to build anticipation. The monster is lumbering and knocks over trees and leaves footprints in the ground. The trapper's pet can also sniff out the monster and when the monster feeds, carrion birds make their way to the area. All of these play out in forcing the monster into a risk versus reward situation: how much food can be consumed before the hunters catch up? Even if the hunters do catch up, there is no guarantee how things will play out. The trapper can create a mobile arena which essentially domes in the area for a short time. The monster can eventually flee, but it has to stand and fight for a time. However, the monster might slip away first, forcing the pursuit to continue. Very seldom does a match end where a low evolution monster decided to make a stand during the first encounter. If you do not want to play online, the AI actually does a pretty reasonable job of not embarrassing itself. In some ways, I prefer that because I can choose which class I want to be and focus on it. I actually found it easier to play as the monster against players than the AI, who do a great job of zeroing in on you if you dillydally for any length of time. You also do not have to combat connectivity issues. Oddly, two of my online games completely froze the game as well, forcing me to have to retreat to the PS4 menu and close the application. One time that worked. The other? It forced a hard reboot of the PS4, followed by that hard drive check. That was less-than-awesome. The best mode is the Evacuation. Here you participate in a series of five battles, each one with different objectives and maps. Whether you win or lose impacts the next map(s). For example, if the hunters lose on a quest, the monster might find health-restoring plants during the next stage. Should the hunters win, the monster might find more birds in the air to give its presence away. It is a cool system that claims to have over 800,000 total options. I think that number is probably a bit deceiving because while yes 'technically' a parameter might be different, the core play does not change enormously most of the time. Still, this is as close as Evolve comes to a story or campaign mode, and it is where I spent the majority of my time. The combat is fast and polished and the concept is solid. The problem is that the content is somewhat lacking - especially right at first where you only have access to one of each of the hunter classes and one monster. However, I love games that have progression hooks, and the one found here in Evolve really appealed to me. I had to deal a certain amount of damage with Markov, the default assault specialist, using mines and two different types of guns. Upon doing so, I unlocked a second assault hunter and the ability to unlock another star/level on those three weapons. Each time I did, their stats improved slightly. Also there is an overall level applied to you as a player, and as you gain levels, you unlock new perks for hunter and monster alike. I have no problem with a progression system like this, but the first sign that Evolve was going to be a bit more than greedy with its DLC scheme started to show up here. Skins are skins - you can buy them or not. I choose not generally. That said? If you really like them - feel free to express yourself. Some skins can be unlocked through play as well. The season past offers to unlock four new monsters later when they become available. There is a ton of DLC here, and that it is on first day certainly does rub some people wrong. 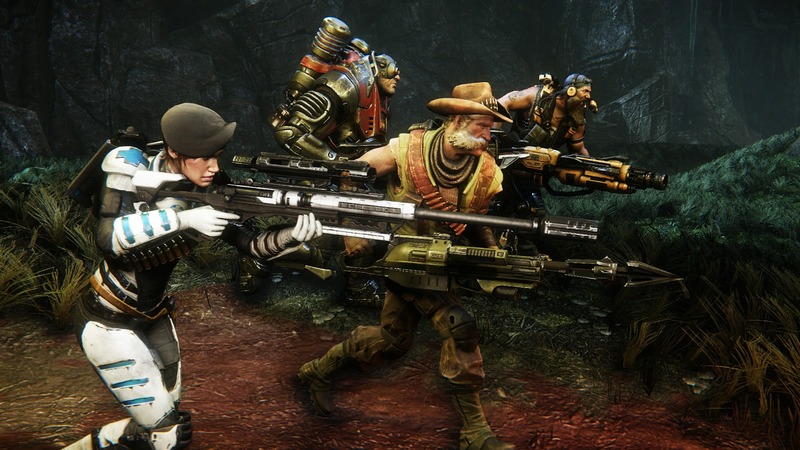 Evolve was clearly built with DLC in mind. I am not a fan of the model because it leaves the impression you bought an incomplete game, but for me it is not a deal-breaker in and of itself. However, the relatively sparse overall content is a problem. There are only a handful of maps, hunters and monsters. They are well-balanced, the game plays well and the progression system keeps me coming back. I just wish there was more to it. I suspect that Evolve will eventually go the way of Titanfall - a good game that becomes repetitive far too quickly due to lack of content and options. Of course, they have more coming - but that comes with two catches. One, you have to pay for it and two, by the time the new content comes trickling out, a lot of times gamers have moved on to something else.